Our wedding was in spring which I thought should be reflected in the floral scheme. I had some very unique and specific ideas regarding what I wanted which unfortunately meant I couldn’t simply show a florist a photograph and ask her to copy it. I spent a lot of time with Monika explaining my vision and I think the challenge of trying out something new appealed to her. She was prepared to follow my requests but wasn’t afraid to give her input. We had to have a contingency plan in case the flowers I wanted weren’t available at the time of the wedding so it was nice to be given updates as to what was in the bloom the weeks before the big day. 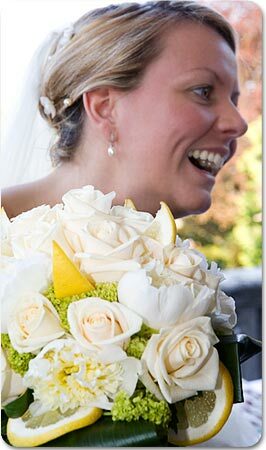 The result was spectacular – my first tears on my wedding day was when I saw my bouquet! Monika is a perfectionist and I could tell on the day that he too was pleased with her work. Of course, I couldn’t have achieved such results without Clara who firstly introduced us and secondly spent endless hours translating between the two of us and coordinating with the other suppliers so they would know how their products (car, wedding cake etc.) would be presented. Just when I thought things couldn’t get any better, I arrived back from honeymoon to see that mine was bouquet of the month! We were so scared our wedding would fly by that we decided to have a weekend of celebrations instead of a day. Felix worked tirelessly the entire weekend so that we now have an excellent reportage of the entire time, from the preparations right through to the celebrations. By the end he had lots of new friends (he was more of a guest than a photographer!) and we have some of the most amazing photos. He made everyone feel so comfortable, which frankly makes for a better photo. He captured moments we missed and those we never want to forget. It wasn’t until he gave us a presentation after the wedding that we fully appreciated just how hard he had worked. Felix is an energetic and creative photographer, a warm and charismatic person – and has the patience of a Saint for accommodating our endless requirements! Great! I am the author of the bouquet. Thanks, Rache! I like your blog WEDDINGS THE YOYS AND THE JITTERS!! !